Many seeds starts means many labels! Almost all of the yogurt containers that I have saved over the winter, have been repurposed into tags. These label tags can be saved and used again next year too. 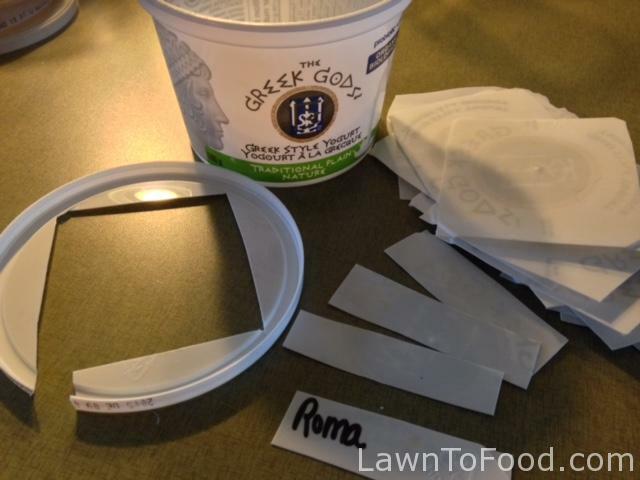 The plastic lid makes 4 tags and after cutting the bottom and the thick rim of the container off, the sides can be sliced into 12-16 tags. I use a Sharpie felt pen to mark the type and variety. For example,”Cabbage” then below, so its still visible from the top of the tag, “SAVOY”. Once the Sharpie ink is dry, it won’t smudge. 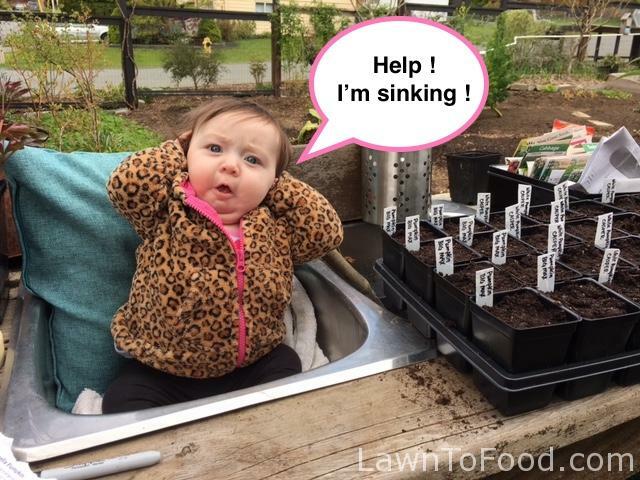 In the past, I have found that store-bought seedlings can be lanky, fragile or root bound, and generally not ready for life outside of a commercial greenhouse. We are instructed to spend a week or two hardening-off purchased seedlings, but I think most of us simply plant them directly into the garden, which can cause them some shock. They are also boosted with chemical fertilizers for rapid growth and often sprayed with neonicotinoids or other harmful substances which I prefer to avoid. I am very happy with the seedlings that I am growing this season. Learning the proper methods of seed starting, and having the correct equipment, has been the difference. Once they germinated in warm indoor temperatures, I moved them into our cool carport and put them under full-spectrum flourescent lights for 16 hours per day. They seedlings are only watered once every 10 days to prevent fungal issues. I believe the proper lighting is why these seedlings are progressing so well. I’ve used organic and regional seed varieties, that have been grown in organic OMRI certified starter mix. 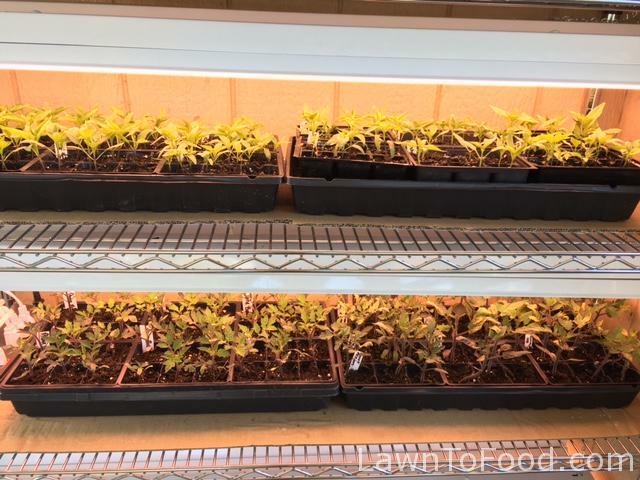 My 2017 pepper and tomato seedlings growing under lights in our open air carport. 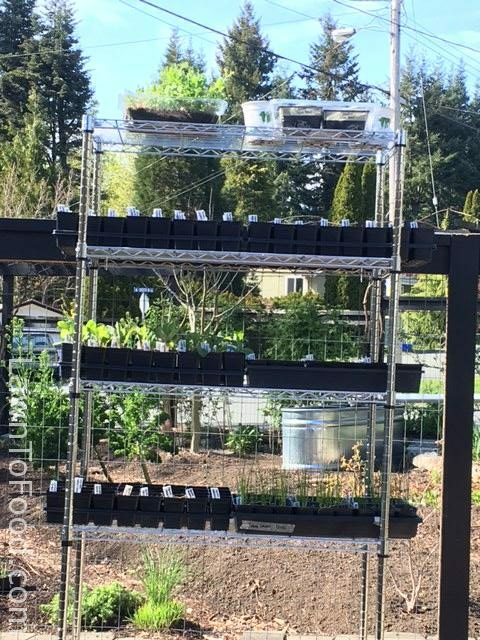 On colder evenings, I swaddle this grow shelving with clear plastic. My homegrown efforts are organic, robust, and perfectly acclimatized to our outside weather conditions. They are raised in the carport, and then hardened off for a few hours each day, near the yard where they will eventually be planted. I think that all of these factors will help them flourish. Cool season seedlings enjoyed some sunshine, wind & rain during the day on this shelf unit. I’d bring them into the carport overnight for protection and where they received more time under the lights. In this photo, new flats of warmer weather crops have been recently planted. If you can’t start your own seeds be sure to search for plant sales in the early spring, where you can find many healthy, local variety and weather-adjusted starts for your planters and property. Also check out your green-thumb neighbours, if they are anything like me, there will be an abundance of seedlings in their midst. Which may be a perfect opportunity to acquire 1 or 2 plants of some varieties for smaller, or patio vegetable gardens. 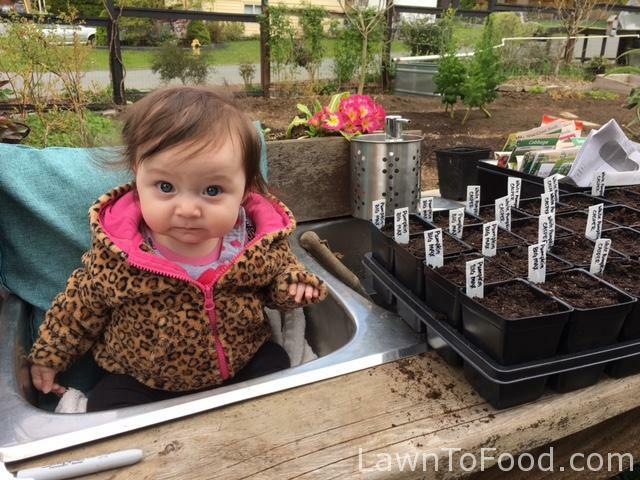 My granddaughter Paisley Daisy was helping me at the Garden Washing Sink in 2017 as I started squash, pumpkin and melons for summer planting.